As I was catching up on my blog reading, I hit a road blog on Cee Nuner’s blog. A good road block. She posted a photo of her new heat pump in her weekly Odd Ball Photo Challenge section. How odd indeed. 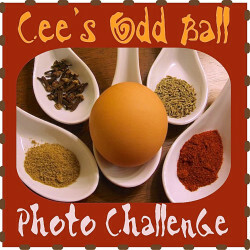 Since I was in a blog funk, I thought about some strange photos I had that would fit her Odd Ball Challenge. In October 2012, we were in Boerne, Texas and had stopped at the Dodging Duck Brewhaus and Restaurant for lunch. Before we left the restaurant, I thought it would be best to make a visit to the bathroom. I am not sure why, but I was captivated by the hand painted tiles on the walls in the men’s bathroom. Something you say when teaching someone. Usually to encourage or indicate they have done something right. Vernacular peculiar to Texas and other southern locations in the US, means one is about to do something or it is in the process of being done. It is not every day that you step into a public bathroom and find some photo worthy items(s) that are captivating. Not only does the Dodging Duck Brewhaus and Restaurant have cool tiles in their bathroom, they have pretty good food and brews from their micro-brewery also. This entry was posted in Cee's Photo Challenges, Photography, Texas and tagged Boerne, Cee’s Odd Ball Challenge, Dodging Duck Brewhaus. Bookmark the permalink. I see I’m not the only one who takes photos of bathrooms!!! Great odd balls. Ha! There’s a message everywhere you look!